Blackboard has announced a major shift in direction from a focus on a single LMS product (Learn) to a multiple LMS approach including long-term support and involvement in Learn, ANGEL, Moodle, Edline, and Sakai. If you have not yet seen today’s Blackboard press releases about this, you should read them carefully and then come back to finish reading this blog post. If you don’t read the press releases first, this post may not make a lot of sense. Chuck Severance is Crazy: When I say that Chuck Severance is crazy, I mean crazy in the very best possible way. Crazy as in completely honest. Crazy as in willing to say things that might offend other people. Crazy in the sense that he is willing to be critical of his own actions. Crazy in that he believes in the promise of open source software in higher education more than he cares about his own career advancement. Crazy in that he is willing to take risks, to fail, and to learn from his mistakes. As described in the above Blackboard release, I will be spending a significant amount of my time working for Blackboard in the area of Sakai engagement and open source engagement in general. I will continue to be a full-time faculty member at the University of Michigan School of Information and will continue to teach courses like SI124, do research, advise students, arrive late at my office hours when I go to lunch at the Jerk Pit, work with the Sakai team at University of Michigan, make open educational resources, make new courses, host the annual talent show, and invent things like the iPad Steering Wheel Mount to keep people from having to pick up a phone to text while driving. 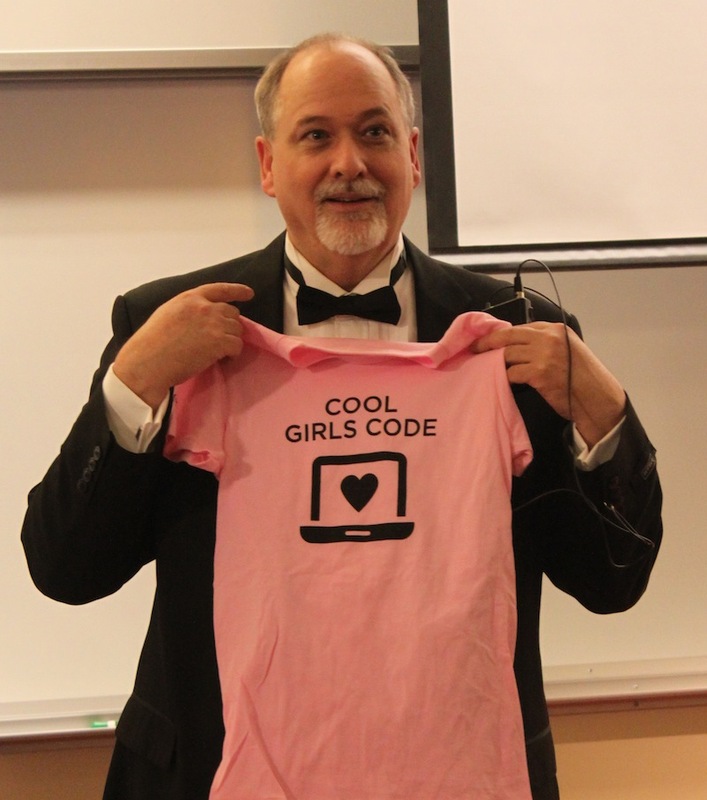 Just a normal faculty member doing normal faculty member things that also works for Blackboard. I have been talking to and encouraging Blackboard for a long time to think more broadly about the LMS market. For me it has never been about a single dominant LMS for all kinds of teaching and learning. There is a reason that so many learning management systems exist and need to exist. Looking at Phil Hill’s infographic on Educational Delivery Models, he identifies nine quite distinct approaches and he does not even capture the differences between pre-school, K-12, community college, higher education, professional development, training, certification, and a host of other places where educational technology is needed. The notion that we will somehow find the “one true LMS” that will solve all problems is simply crazy talk and has been for quite some time. I am happy to be now working with a group of people at Blackboard that embrace the idea of multiple LMS systems aimed at different market segments. We will bring a diverse set of learning products to the market and place the most appropriate product(s) in the hands of teachers and students. However, once you accept that there will be a lot of different Learning Management Systems, we solve one problem and exacerbate another. A company supporting multiple learning management systems, needs to be able to move courses, rosters, content, and tools between those different learning management systems in a friction-free manner. That means we need to get really good at portability and interoperability and do it in a hurry. A long journey toward interoperability. As a teacher and software developer, I have been working to build portable and interoperable technology and content since the 1990’s. My recent work has been as the Chief Architect of the Sakai Project (2004-2005) and the first Executive Director of the Sakai Foundation (2006-2007) and then more recently with the IMS Global Learning Consortum (2008-present). The education community will benefit greatly from a Tool Portability Profile [TPP] that provides an open, non-proprietary, and fully articulated specification for interoperable software. Any institution or commercial entity can build to this Profile, thus helping all institutions integrate software from multiple sources as their timing may require. The economics of software for the education community are greatly served by a proven set of pre-integrated, modular, open source applications that any institution can adopt incrementally or as an integrated set of tools. It was personally disappointing to me that we never achieved the goal of enabling truly portable software across commercial and open source LMS systems as part of the Sakai project. By 2007, Sakai had become a successful LMS and the Sakai community had expanded from the four founding schools to over 120 partners. Over time, the leadership and culture of Sakai moved from our idealistic founding notions of being a positive force across the whole market to a narrower view of competing for market share. So I quit as the Sakai Executive Director and joined the faculty of the University of Michigan School of Information. 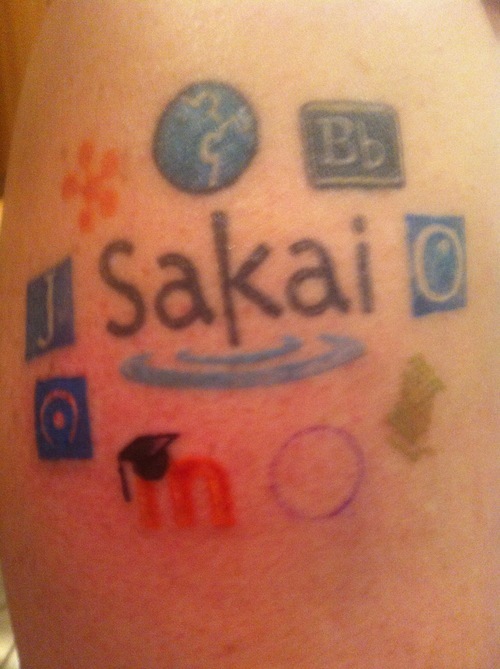 Sakai had an important role in founding both the Tools Interoperability and Common Cartridge standards and I believed that these were the future of interoperable tools and data. In 2008, IMS hired me as a consultant / evangelist / developer to help increase the velocity of these standards in the marketplace. This was great because I was paid to work with all the vendors in the marketplace (Blackboard, ANGEL, Moodle, OLAT, Sakai, Desire2Learn, Instructure .. ) trying to get them to align on common approaches to import and export and plugging tools in. Learning Tools Interoperability started a small, underground activity with only a few people involved – we did not know if we would be successful – but we were having fun as the adventure unfolded. We tried anything to get people’s attention. Marc Alier made a video predicting a terrible fate for Learning Management Systems if they did not add support for LTI. But from humble beginnings, by 2011 everywhere you went, people were talking about LTI and Common Cartridge. And IMS Learning Tools Interoperability 1.1 was just completed adding the ability for an external tool to return grades to an LMS over web services. I have been on this educational technology interoperability quest for fifteen years now and things have turned out so well that I could sit back and coast for a few years. I could go to IMS meetings, give workshops around the world on LTI, fly around and give invited talks about Sakai, Open Source, IMS or some other pithy keynote topic. I could work on my second million frequent flier miles on Delta and maintain my friendship networks around the world. I could work to develop LTI 2.0 and transition IMS from SOAP to REST bindings. etc. Actually I am going to do all of that – it sounds pretty good. But, I will also take a risk and try to take interoperability and portability to the next level for the entire market. I am fond of telling other people, “Just when you think that you have reached the end of a journey is when you see the beginning of the real journey.”. Working with Blackboard, ANGEL, Moodle, Sakai and Edline in a coordinated fashion embedded inside of Blackboard with a “dream team” of LMS architects and helping to bring Blackboard’s significant resources into the open source ecosystem in a responsible manner and advancing the cause of portability and interoperability across multiple products in the marketplace even more rapidly than before is that next journey. I understand that the territory is uncharted because no one has ever tried this. I understand and accept that I might fail or come up a little short. I am a little nervous but mostly eager to get started and see where this road leads. With Blackboard’s support, I will be able to greatly increase the time I spend working directly on Sakai. Blackboard has signed a Corporate Contributor License Agreement (CCLA) to make sure that when Blackboard pays me to work on Sakai, the contributions have proper IP. When other Blackboard employees start making contributions to Sakai, Blackboard will sign CCLA’s for them as well. 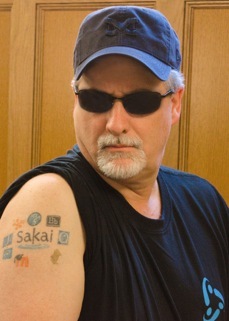 I will now have access to Blackboard internal resources to bring to bear on improving the community edition of Sakai. The kinds of resources I can tap into include the Blackboard QA team, Performance Testing Team, Documentation Team and others. There are already people who have been testing and working on Sakai within Blackboard. In the next few weeks I will be meeting with them and exploring how we can turn the work they have done into something that is valuable to the community. I am a member of the Sakai CLE Technical Coordination Committee. There are other commercial members of the TCC: Sam Ottenhoff (Longsight), Matt Jones (Longsight), Aaron Zeckoski (Unicon), and John Bush (rSmart). All of these people are part of the TCC not because of where they work, but because who they are and what they contribute. My initial focus in Sakai will be to spend time and resources increasing the velocity of the Sakai 2.9 release working closely with and taking guidance from my colleagues on the TCC. I will continue to be on the Sakai board. Sakai board members are individuals and do not represent their organizations. For example, Nate Angell is associated with rSmart, Michael Feldstein is associated with Cengage (formerly associated with Oracle), and Maggie McVay-Lynch(board chair) is associated with Thanos Partners. My three-year Sakai board position expires at the end of this year. I don’t expect to become a developer of closed-source applications. My management at the University of Michigan School of Information (my faculty position) have explicitly stated that this arrangement works best when the actual code I produce is open source. I can advise proprietary product teams in terms of how to best articulate with open source communities or how to become more open in their own approaches to their products. Just for example, with the announcement that ANGEL is no longer end-of-life, I might advise (my good friend and brand new co-worker) David Mills that there is only one remaining opening in my IMS Learning Tools Interoperability “Ring of Compliance” tattoo and he and Kellan Wampler had better get coding. The reality is that there is no such thing as a rock-solid plan. The tasks in this list are not a “to do” list, nor are they “campaign promises”. They are merely a collection of what I am thinking I might do in the first year or so of this arrangement. Throughout the process I will be talking and listening to my colleagues in Sakai, IMS, at the University of Michigan as well as my new colleagues in Blackboard to work out the right directions to take to get to win-win results. If you have a question or suggestion – just talk to me. If you have a concern – let me know. This is a pivotal moment in the evolution of learning management systems. I am excited to be part of a talented Blackboard team that is dedicating itself to moving this industry to the next level. This entry was posted in Uncategorized on March 26, 2012 by Charles Severance.